Free Shipping Included! 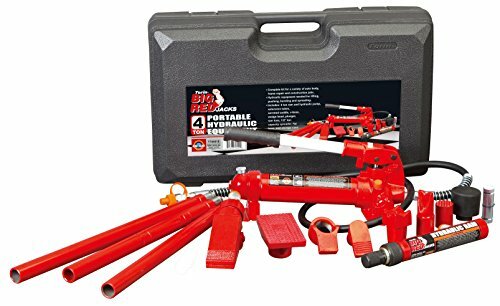 Torin Big Red Portable Hydraulic Ram: Auto Body Frame Repair Kit with Carrying Case, 4 Ton Capacity by Torin at Scranton Sewer. MPN: T70401S. Hurry! Limited time offer. Offer valid only while supplies last. Torin Jack Porta Power with Carry Case - 4 Ton Heavy-duty auto body, frame repair and construction hydraulic equipment in one compact carry case. Torin Jack Porta Power with Carry Case - 4 Ton Heavy-duty auto body, frame repair and construction hydraulic equipment in one compact carry case. Snap lock design for fast and easy assembly. Automatic pump overload system prevents ram and equipment damage. Durable heavy walled extension tubes for long service life. Flex head features permanently molded interlocked rubber pad to prevent separation. Long handles for low pumping effort. 4-13/16inch ram stroke, 4-3/4inch minimum lift and 13inch maximum lift. Carry case includes: 27inch, 19-1/2inch, 15-1/2inch, 8-1/2inch and 3inch extension tubes; male connector; wedge head; serrated saddle; flat base; ram toe; plunger toe; rubber head; 90 combination head and spreader. If you have any questions about this product by Torin, contact us by completing and submitting the form below. If you are looking for a specif part number, please include it with your message.